They shot on my Paris. Mon amour. My home since 10 years. I immediately fell in love with its lively dirty streets, with this belle époque café where I can find bone marrow, with this tiny vietnamese restaurant where the owner instantly remembers you name, with the moroccan boulangerie at the corner, which makes ones of the best baguettes in town, with my sunday market on the boulevard Richard Lenoir where you can buy crêpes and couscous to go. With my newly met friends from all around France, from all around the world, of all colors, loving who they want, loving how they want, loving so much. Most are atheist, some are christians, some are muslims, all are humanist. Where I can smile, tell whatever I want never fearing to be judged, wear short dresses and high-heels, have the love life I choose, swear, drink wine and laugh out loud. My friends and I where in the right place the oh-so-many times we shared cheap wine and not so sprinkly beers in front of the Carillon – a wonderful mixed community bar – eventually crossing the street for a bo-bun break at Le petit Cambodge. Friday they shot my Paris. Straight in the heart. Straight in my heart. They wanted to kill our night, our joie de vivre, our freedom. Some would think they killed our carefreeness. Yet we were not so carefree already. We are worried about the world. About the raise of the ones who hate life and worship death, about global warming, slowly consuming our one and only planet, about the capitalism that makes industries turn people into slaves. So we were seeking for alternatives. For ourselves and for the world. Because we love it so much. Being vegetarian, helping refugees, quitting their job because they do not believe in the company they work for, creating shows to make people happy, reducing their plastic bags consumption, is what I see people do around me. Most of us do not believe in god, we believe in humans, and won’t let some frustrated cowards ruin the whole world with their filthy ignorance. Their bullets may have killed the most innocent and beautiful people. 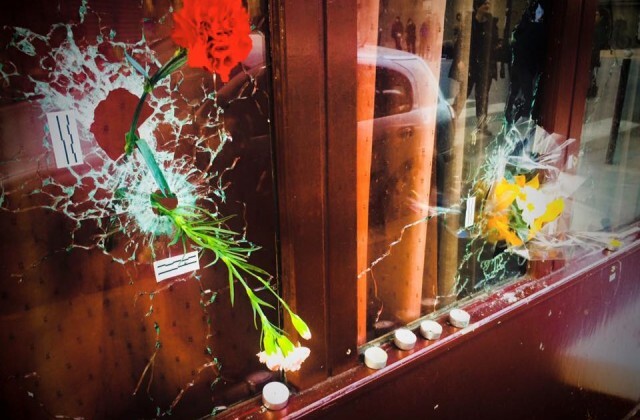 They did not kill the heart of Paris. The fear just made it skip a beat. One day. Today it beats with anger and pain. It beats with love and fraternity for each other in Paris, in Beirut, in Syria. We will keep smiling, drinking, kissing and fighting for what we believe in. Such a beautiful post. Thankyou for sharing it with us and giving us an insight into your special, precious world. Here in London we are crying for what has happened to your city. I never commented before, but this beautiful post made me cry. All my love to Paris and the brave Parisians. Beautiful. So glad to know you are safe. All the love. I am so sorry for Paris. I am so glad to find that your heart is as great as your eye. I can only agree as above. Aloïs – I never commented before, I just normally quietly devoured your fashionable commentary. You wrote a beautiful poem here, I am touched… let’s continue to celebrate life and beauty as you always do.